Gloria Green is a long-time neighborhood advocate and community organizer in Grier Heights and serves as the Executive Director of the Grier Heights Community Center. She dedicates her time to improving the lives of those living in her community and we have worked together on many projects for Grier Heights. As part of her job, she organizes events and classes that entertain residents of the community and offer guidance on different subjects. In any given week, Gloria will be hosting line dancing one evening and classes on rebuilding credit and working toward home ownership the next. Gloria is devoted to her community and to Charlotte as a whole. I am humbled and honored to have her support. I know for a fact that it’s not all about politics for Patsy Kinsey. It’s not about fame or fortune for her. It’s about people and the passion that she has for people is just what we need in this neighborhood, that’s what we need in politics. I’m not sure that people realize all the great things that she’s done for the Grier Heights neighborhood. We know that if there's something we're not comfortable with, we can call our city council person and she actually listens. 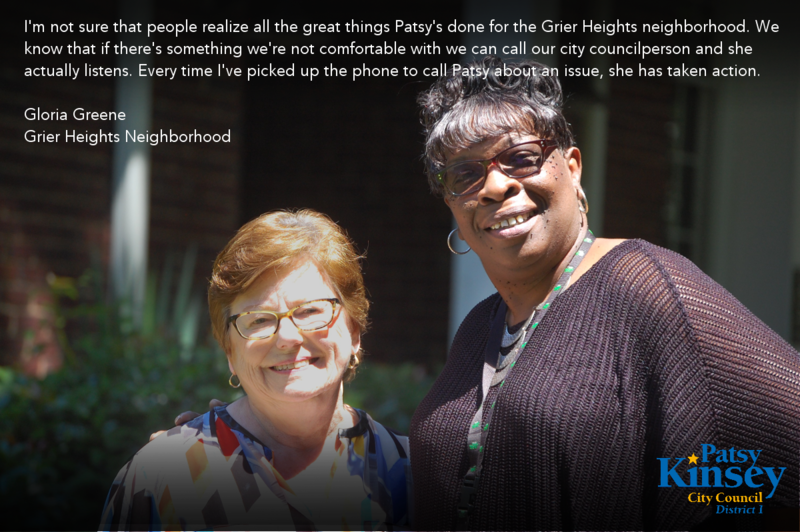 Every time I’ve picked up the phone to call Patsy about an issue, she has taken action. So, I gladly endorse Patsy Kinsey as our next city councilperson in this neighborhood. We’ve got to keep her.